Google is launching superpressure balloons into near space to provide internet access to buildings on the ground. About 30 of the superpressure balloons are being launched from New Zealand from where they will drift around the world on a controlled path. Attached equipment will offer 3G-like speeds to 50 testers in the country. Access will be intermittent, but in time Google hopes to build a big enough fleet to offer reliable links to people living in remote areas. It says that balloons could one day be diverted to disaster-hit areas to aid rescue efforts in situations where ground communication equipment has been damaged. But one expert warns that trying to simultaneously navigate thousands of the high-altitude balloons around the globe’s wind patterns will prove a difficult task to get right. Google calls the effort Project Loon and acknowledges it is “highly experimental” at this stage. Each balloon is 15 m (49.2 ft) in diameter – the length of a small plane – and filled with lifting gases. Electronic equipment hangs underneath including radio antennae, a flight computer, an altitude control system and solar panels to power the gear. 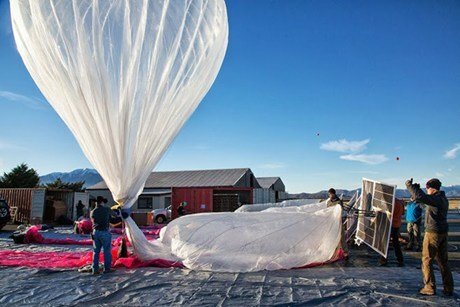 Google aims to fly the balloons in the stratosphere, 20 km (12 miles) or more above the ground, which is about double the altitude used by commercial aircraft and above controlled airspace. The giant tech company says each should stay aloft for about 100 days and provide connectivity to an area stretching 40 km in diameter below as they travel in a west-to-east direction. Google says the concept could offer a way to connect the two-thirds of the world’s population which does not have affordable net connections. “It’s pretty hard to get the internet to lots of parts of the world,” said Richard DeVaul, chief technical architect at Google[x] – the division behind the scheme. “Just because in principle you could take a satellite phone to sub-Saharan Africa and get a connection there, it doesn’t mean the people have a cost-effective way of getting online. A group of about 50 testers based in Christchurch and Canterbury, New Zealand, have had special antennae fitted to their properties to receive the balloons’ signals. Google now plans to partner with other organizations to fit similar equipment to other buildings in countries on a similar latitude, so that people in Argentina, Chile, South Africa and Australia can also take part in the trial. “Google as an organization believes that the more people who use the internet, ultimately, the better the world will be,” added Richard DeVaul. Google is not the first company to pursue such an idea. An Arizona-based firm, Space Data, already provides blimp-based radio repeaters to the US Air Force to allow it to extend communications coverage. Another Orlando-based firm, World Surveillance Group, sells similar equipment to the US Army and other government agencies. However, they typically remain airborne for up to a few days at a time rather than for months, and are not as wide-ranging. One expert cautioned that Google might find it harder to control its fleet than it hoped. “The practicalities of controlling lighter-than-air machines are well known because of the vagaries of the weather,” said Prof. Alan Woodward, visiting professor at the University of Surrey’s department of computing. Superpressure balloons are made out of tightly sealed plastic capable of containing highly pressurised lighter-than-air gases. The aim is to keep the volume of the balloon relatively stable even if there are changes in temperature. This allows them to stay aloft longer and be better at maintaining a specific altitude than balloons which stretch and contract. In particular it avoids the problem of balloons descending at night when their gases cool. The concept was first developed for the US Air Force in the 1950s using a stretched polyester film called Mylar. The effort resulted in the Ghost (global horizontal sounding technique) programme which launched superpressure balloons from Christchurch, New Zealand to gather wind and temperature data over remote regions of the planet. Over the following decade 88 balloons were launched, the longest staying aloft for 744 days. More recently, NASA has experimented with the technology and suggested superpressure balloons could one day be deployed into Mars’s atmosphere.